• Plus, other social events and performances throughout! • Nearly all workshops are 3 hours long. • Attendance in most workshops is limited. • “$75 + 50m” means that a $75 workshop also has a $50 materials fee, for a $125 total. • Our workshops have minimum suggested skill levels, according to the colors at right. All levels! No special skills are required. It will help if you’ve done a little programming. Some programming experience is recommended. LECTURE & PRESENTATION SCHEDULE, Saturday November 7th, 2009. Lecture presentations are free and (space permitting) open to the public. All presentations will be recorded and shared online at our Vimeo feed. 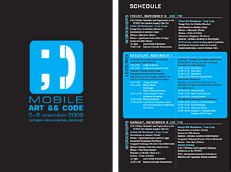 Explorations into the language, aesthetics, and history of mobile arts and interaction design. Live demonstrations by leading innovators in palmtop synaesthetics. …including a special informal meeting about how to jailbreak your iPhone! Technocultural, tactical, and other contextual approaches to mobile computing. 15:20 – 15:55 Tad Hirsch (Intel) Cancelled. The future is already here; it’s just not evenly distributed. We spread it around with a blast from the radical present.